Considering the fact that this peripheral region would eventually come to dominate all of Germany and create the second German empire, its beginnings were entirely unremarkable. What was to become Brandenburg emerged in the form of the North March (or Nordmark), a border zone created by eastwards expansion under the Germanic Roman emperors. This and other new regions quickly became formalised as margraviates as they secured the hinterland between the German empire to the west and the Poles and Pomeranians to the east. The North March itself became Brandenburg in the twelfth century and was especially important as an elector, even providing several emperors of its own. When the Hohenzollerns took over in 1415 things changed. A politically active family, they benefited from the Protestant Revolution when the Teutonic Knights lost their eastern lands, and Prussia was formed. In 1701 this was elevated to a kingdom and, again, benefited greatly from a period of great political uncertainty, this time the Napoleonic Wars, when it expanded widely into the now-disbanded Holy Roman empire and set about securing a role as the dominant German state. Within half a century it was able to formalise its dominance of Germany by founding the German empire. This led it to the First World War, the formation of a replacement republic, the establishment in the south of the Nazi party, and then the Second World War. Following division and reunification, modern Germany is still largely led from the Brandenburg capital at Berlin. Brandenburg began as the North March. This border region was formed in AD 936, when territory to the west of the Oder was incorporated into the March of the Billungs and the North March of the Holy Roman empire. The German word 'march' or 'mark' was also rendered in Old English as 'mierce', meaning 'boundary, borderland'. The English kingdom of Mercia bore this name for much of its existence. The kingdom of Denmark still bears it, as does the modern region of Finnmark in Norway, while Austria was originally the Ostmark. The North March was situated between the March of the Billungers to the north (on the Baltic coast, and the Ostmark and March of Lusatia (Lausitz) to the south. The duchy and kingdom of Saxony bordered all of the marches along their western edge, with soon-to-be Christian Poland and pagan Pomerania in the east. The march counties were founded by German expansion eastwards and the initial reorganisation of conquered territory. In time they became formalised as margraviates. First Ascanian. Duke of Saxony (1138-1142). The margraviate of Brandenburg is created from the March. Brandenburg was formed in 1136 from the North March. In part it bordered the new duchy of Pomerania which had been formed on the south Baltic coast in what is now north-western Poland. Wartislaw I of Pomerania made vast conquests on the west bank of the Oder, and these were placed under the overlordship of Albert I by the Holy Roman Emperor. The title is apparently vacant before being gained by the Wittelsbachs. The margraviate is raised to an Electorate. Holy Roman Emperor Charles IV (1347-1378). Holy Roman Emperor (1378-1400). Died 1419. Pretender to the Polish throne (1382-1383). Restored. HRE (1410-1437). Died 1438. The title is managed by Frederick, Captain & Administrator of Brandenburg, before his Hohenzollern family purchase the title. In 1415 the electorate of Brandenburg was purchased from the Holy Roman empire by the house of Hohenzollern which came from southern Germany, in former Swabia. To the east, the monastic state of the Teutonic Knights was formed during their conquest of the pagan Baltic Old Prussians in the thirteenth century, but this was secularised in 1525, during the Protestant Reformation, and replaced with the duchy of East Prussia. Joining these two possessions together in 1618, the Hohenzollerns formed Brandenburg-Prussia. Captain & Administrator of Brandenburg (1415-1417). A member of the family, grandmaster of the Teutonic Knights Albrecht von Hohenzollern, margrave of Brandenburg-Kulmbach, combines Teutonic East Prussia with Brandenburg. The two segments are run by the two main branches of the family, and East Prussia remains under the control of Albrecht. William, grandson of Elector Albert III, remains archbishop of Riga until the post's secularisation in 1563. The duchy of Courland is divided in two, and the ruler of the western section, Wilhelm, marries the daughter of the duke of East Prussia and regains the Grobina district. The duke of East Prussia (Albert Frederick) dies without an heir and the territory is inherited by Brandenburg. First Elector of Brandenburg-Prussia 1618. The near-constant warfare and rapid change brought about by the Reformation and its Papal response, the Counter Reformation, is finally ended by the Peace of Westphalia, as is the Thirty Years' War. As part of the treaty's terms, Sweden loses Further-Pomerania to Brandenburg-Prussia. Son. Elevated to Frederick I, first king of Prussia. The electorate is elevated to a kingdom by the Holy Roman Emperor, the first German state to be raised in this manner. Prussia gains territory in Poland-Lithuania during the First Partition: Royal Prussia, Warmia, and parts of Great Poland which are formed into the province of West Prussia. Prussia declares war on republican France, along with Austria, as part of the First Coalition. Between 1793-1795 the kingdom greatly benefits by gaining more territory during the Second Partition of Poland-Lithuania (1793), and the Third Partition of Poland-Lithuania (1795), which wipes the joint states from the map. With these targets achieved, and with the Netherlands and Hessen-Homburg having been invaded and captured by France, Prussia agrees a separate peace with the French in 1795. The emperor of France, Napoleon Bonaparte, heavily defeats Prussia and the Fourth Coalition, and liberates Prussia's holdings in Poland, forming them into an Imperial satellite state. In 1807, Pomerania is seized from Prussia. France is defeated at the end of the Napoleonic Wars and Prussia gains Pomerania from Sweden as part of the reshuffle of territories and power that follows during the Congress of Vienna. Prussia also gains Saxe-Merseburg, Saxe-Weissenfels and Saxe-Zeitz from the kingdom of Saxony. The kingdom has to fight again, however. The duke of Wellington's Anglo-Dutch-German army defeats Napoleon's resurgent French army at the Battle of Waterloo on 18 June in conjunction with the Prussian army, decisively ending twenty-five years of war in Europe. An economic crisis in 1847 is the final straw for the French working classes, after a steady worsening in their general conditions. In a year of European revolutions in 1848 (Hessen-Darmstadt, Ireland, Liechtenstein, Lombardy-Ventia, and Wallachia also experience problems), they revolt against the government and the monarchy is overthrown. In the German lands, the rapid industrialisation of the Rhineland has formed a large working class there and a more vocal peasant class to the north is increasingly desperate to half an autocratic Prussia's removal of their freedoms. Brother. Kaiser of Germany from 18 January 1871. Prussia gains the former Saxon territory of Saxe-Lauenburg. 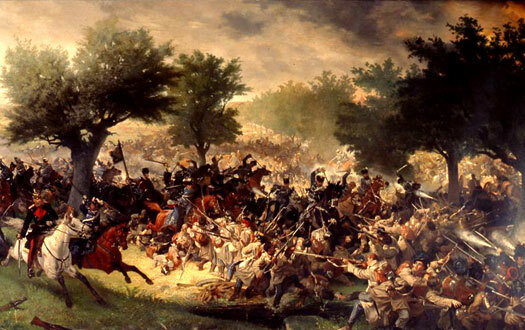 The exile of Queen Isabella of Spain to France starts a remarkable chain of events. Isabella's abdication on 25 June 1870 leads to the Franco-Prussian war when France refuses to accept the possibility of the Prussian Prince Leopold of Hohenzollern-Sigmaringen gaining the Spanish throne. French troops are humiliated by Prussia's ultra-modern army and the siege of Paris brings about the downfall of its empire. Following the victory, the Second Reich (Germanic empire) is declared by Prussia, which now displaces Austria as the main Germanic power, as well as being the dominant power throughout central and western Europe. The remarkable victory over the French empire in 1871 allowed Prussia to declare the 'Second German Empire' (or 'reich') under the former Prussian King William I, now Emperor William. Pursuing an aggressive policy of integration within Germany under Chancellor Bismarck, the new empire incorporated the grand duchy of Baden as a state under its overall control. Bavaria, Hessen-Darmstadt, Lippe, Saxony, and Württemberg were also forcibly included within the empire as vassal states. The unofficial national anthem of the United Kingdom from around 1745 was and is 'God Save the Queen'. It has never officially been adopted and its origins have yet to be uncovered, although various important eighteenth century composers have been credited. The same tune (albeit with different words) is still used by Liechtenstein and Norway, while in the German empire it was thanks to Chancellor Bismarck that it saw use as the national anthem until the empire fell in 1918. Somewhat surprisingly to modern British ears, the USA also uses it as a patriotic melody. Italy and France disagree over their respective colonial expansionism so, seeing an opportunity to isolate France, Bismarck welcomes Italy into a Triple Alliance with Prussia and Austria. Italian relations with Berlin now enter their best period, although Vienna remains icily formal with its former subject. Son. Died after 100 days' rule. m Vicky, dau. of Victoria. Son. 'Kaiser Bill'. Fled to Holland in 1918. A year after Spain loses the Spanish-American War, it sells the last of its islands in the Pacific to Germany. A British Protectorate is created for Zanzibar under the terms of the Helgoland-Zanzibar Treaty in which Germany undertakes to avoid becoming involved in British interests in the area. With the accession of the incapacitated Prince Alexander of Lippe, the 'Lippe-Detmold Question' is first raised. Its significance lies not so much in the relatively obscure successional conflict that is triggered in Lippe but in the way it highlights certain weaknesses within the administrative structure of the German empire. The Supreme Parish and Collegiate Church (Evangelical Oberpfarr- und Domkirche) is completed in the heart of Berlin, serving as the primary church of Germany's Protestants. The German empire moves swiftly to support its ally, Austria-Hungary, in a long-anticipated Great War (later more readily known as the First World War, or World War I). 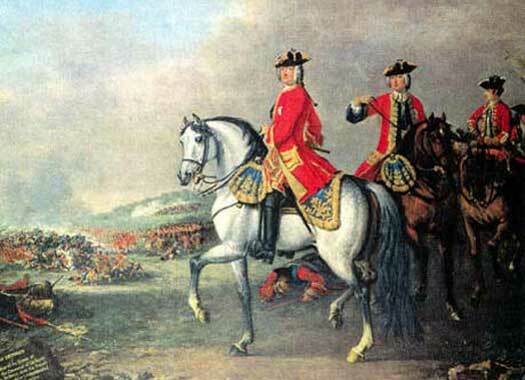 At the start it is successful against the Russian invasion of Prussia, routing their army at the Battle of Tannenberg, and in the west its armies reach the northern outskirts of Paris (occupying Luxembourg along the way) before they are stopped by the armies of Britain and France, together with the small Belgian army. Turkey joins the German cause on 31 October, but Afghanistan remains neutral, refusing to attempt an attack on British India. Other neutral countries include Denmark, Norway, and Sweden, while Japan joins the allies. In the secret Treaty of London of 26 April, Italy agrees to abandon its allies, Germany and Austria-Hungary, declaring war on them instead. Germany begins to conquer the Baltic Provinces by taking Courland. A German U-boat sinks the SS Lusitania on 7 May, killing 1,198 and inflaming anti-German feeling in the USA. German vessels which have been interned in Portuguese ports are seized by the country's government, so William declares war on Portugal. It responds by sending troops to the Western Front to fight alongside the British. On the Eastern Front, Russian defeats bring Latvia and Lithuania under Imperial control, much to the relief of the German-descended land-owning aristocracy there. In April, Bolivia, Cuba, and the USA all side with the allies but Bolivia takes no active role in the war. In October, Brazil, Peru, and Uruguay also join the allied side, with Ecuador and Panama following suit in December. Venezuela remains neutral. In April, Guatemala joins the allies, followed a month later by Costa Rica and Nicaragua. Honduras makes the same move in July. The conquest of the Baltic Provinces is completed by Germany with the taking of Estonia. But as the diplomatic, and social situation worsens in Germany in late 1918, the country loses its Austrian ally on 3 November. 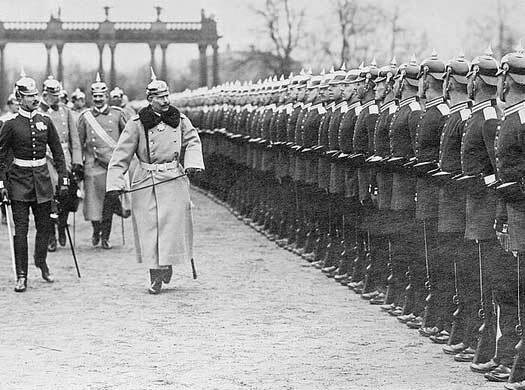 William II, at the Western Front with his troops from 29 October following riots in Berlin, is forced to abdicate on 9 November, signalling the end of the House of Hohenzollern in power. The next day he flees to neutral Holland and spends the remainder of his life as a gentleman farmer on a private estate, under loose house arrest by the Dutch Government. The war officially ends on 11 November. Following the collapse at the end of the First World War, Germany became a republic with a new government, proclaimed on 9 November 1918, but without a president until 1919. Wracked by uncertainty and civil war at the start, it was never entirely stable and, pressured by massive inflation and unemployment, excessive war reparation payments to the Allied nations, and plotting from extremist fascist groups, it fell in 1933, to be replaced by a Nazi government. After the conclusion of the Second World War, two separate governments were established in the now-divided Germany, east and west, until 1990, when the country was reunited under the western government and Berlin again became the capital of a single Germany. Germany fared badly from the armistice of 1918 and the Treaty of Versailles in 1919. In China, it lost Tsingtao Fortress which housed the German East Asia Squadron's headquarters. German-leased territories in China's Shandong Province were also taken, as were the Marianas, Caroline, and Marshall Islands in the Pacific, all of which were formerly part of German New Guinea. Successive claimants to the Hohenzollern imperial throne are shown with a shaded background, while rival claimants and disqualifications are shown in green text. Deposed emperor of Germany. Died 1941. Germany adopts the democratic 'Weimar Constitution' following the abolition of the German empire. This new Germany consists of the former German kingdoms and duchies, all of which have now been abolished, which include Baden, Bavaria, Hesse, Lippe, Saxony and Württemberg. The new Polish state ends the Russo-Polish War and confirms its borders, which also include West Prussia, cutting off East Prussia from Germany, which has already lost Pomerania. The Third Reich ('third empire' of Germany, which claims the first (Holy Roman) and second (German) empires as its forebears in order to attain a level of legitimacy) is established under Adolf Hitler's dictatorial Nazi rule, sweeping away the Weimar republic. The German constitution is suspended. Central Europe is rife with political activity and violence at this time, largely driven by the Nazis (or at least used for their own ends). Neighbouring Austria soon experiences its own unrest. Austrian Nazi leader, or 'fuehrer'. For much of the Spanish Civil War both Hitler and Mussolini's Italy supply weapons and even aircraft to Franco's forces. For Hitler, it proves to be a trial run for his 'blitzkrieg' tactics of 1940. Austria is annexed to Germany in 1938, as is Czechoslovakia's Sudetenland, while the Teutonic Knights are outlawed. 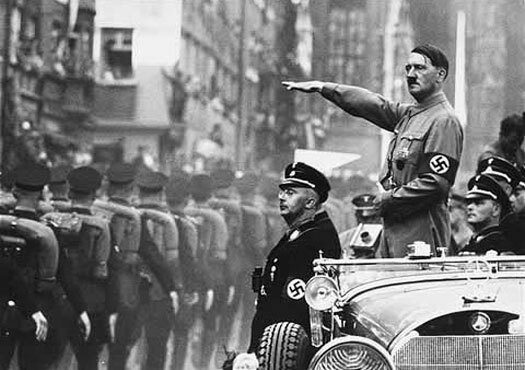 Adolf Hitler authorises the invasion of Czechoslovakia on 15 March 1939. The Nazi invasion of Poland on 1 September is the trigger for the Second World War. With both France and Great Britain pledged to support Poland, both countries have no option but to declare war on 3 September. The German invasion of the Low Countries begins, using a new military doctrine called 'blitzkrieg', with the result that the Netherlands, Belgium, and then France are invaded and occupied. Later in the same year, the Baltic States, Lithuania, Latvia and Estonia, are also occupied, as are Denmark and Norway. Sweden retains its neutrality. Greece is occupied, and a pro-German coup in Iraq is suppressed. In December, Costa Rica, Cuba, El Salvador, Guatemala, Honduras, Nicaragua, Panama, the Philippines, Puerto Rico, and the USA join the war on the allied side, initially against Japan, but Germany is soon included. Portugal, while officially neutral, provides Great Britain with naval facilities in the Azores. Hitler launches Operation Barbarossa on 22 June 1941, this being the code name for the Axis invasion of the Soviet Union. The act opens what becomes known as the Eastern Front, into which millions of Axis troops are sucked, including large numbers of the Austrian military forces. Eldest son. of William II. 'Little Willy'. Renounced throne Dec 1918. Eldest son. Disqualified by making a morganatic marriage. Peru becomes the first South American nation to declare war against Germany, joined in August by Brazil. The sinking of a Mexican tanker also brings that country into the war on the allied side. In April, Bolivia joins the war on the allied side, while Colombia joins in July. In September, Germany takes control of Albania and Istria, as well as northern Italy in the face of the Allied invasion and liberation as far as Rome. Finland is invaded, but the Finns manages to expel German forces from Northern Lapland in the Lapland War. Ecuador, Paraguay, Turkey, Uruguay, and Venezuela belatedly join the allied side in the war in February, while Argentina joins in March, and Chile joins in April. In the same month, as Adolf Hitler celebrates his fifty-sixth birthday, the first Soviet Russian artillery shells fall on Berlin. Hitler subsequently commits suicide in his bunker on 30 April as Soviet forces overrun Berlin. Nazi Germany surrenders unconditionally on 7 May to the Allies at General Eisenhower's HQ at Rheims in France. Following the Nazi surrender, Germany is occupied by the forces of the Soviet Union, the United States, Britain, and France until 1949. The victorious Russians take East Prussia and annexe it directly to the state. The German population either flees or is expelled and is replaced by an imported Russian population. In fact, the German defeat triggers mass reprisals against anything and anyone with German links, especially in the east. Much of the German-speaking population is expelled into Germany by Eastern European states, creating one of the biggest population movements of the modern age. This is alongside millions of other displaced persons trying to get back to their home countries through the chaos of the immediate post-war period. Soviet Russian forces lift the blockade of Berlin (24 June 1948 to 11 May 1949), during which the 'Berlin Airlift' makes 278,228 supply flights. The sectors controlled by the United States, Britain and France are merged to form the Federal Republic of Germany in West Germany on 7 October 1949, while the Soviet zone establishes the German Democratic Republic in East Germany. Second son of William II. Born 1907. Son. Disqualified through two morganatic marriages. Brother. Disqualified through morganatic marriage. Brother. Born 1944, died of injuries in 1977. Next in line for title. The USSR forms the Warsaw Pact in direct response to the admission of the Federal Republic of Germany (West Germany) into Nato whilst itself being barred from joining. The states involved in the founding of this eastern alliance are Albania, Bulgaria, Czechoslovakia, the German Democratic Republic (East Germany), Hungary, Poland, Romania, and Russia. The East German government closes the border with West Berlin on 13 August and begins building a dividing wall. The Berlin airlift follows, saving West Berlin from annexation by the Communists. Germany is officially known as the 'Federal Republic of Germany', a central European state that ranks amongst the most powerful on the entire European continent. It operates through a federal parliamentary system which, to an extent, preserves some of the internal boundaries of the former independent German kingdoms and principalities. In fact, those sixteen constituent states still retain some sovereignty of their own. With a capital in Berlin, Germany is neighboured by Poland and the Czech Republic to the east, Austria to the south-east and south, Switzerland to the south, France, Belgium, and the Netherlands to the west, and Denmark to the north. Modern Germany descends from a broad swathe of central European territory that was known as Germania during the Roman empire period. Its current political foundation arose thanks to the Carolingian empire of the Franks. The subsequent formation of the Holy Roman empire under purely German leaders saw its borders crystallised, especially on the always more fluid eastern side. Following the collapse of the empire, the northern German kingdom of Prussia quickly became the dominant force in German politics. It formed a pan-German empire in 1871 and led its vassal states into the First World War in 1914. Defeat in 1918 led to the unstable period of republics which saw the rise of Nazism and the triggering of the Second World War in 1939. Defeated again by 1945, Germany was occupied by the Allies until the slow collapse of the Soviet Union in the late 1980s. 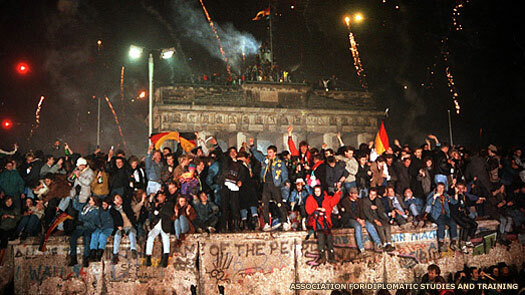 The dramatic fall of the Berlin Wall in 1989 was the trigger for German reunification, which took place on 3 October 1990. This was not a merger of the two Germanies but a continuation of the former Federal Republic of Germany in West Germany. It retained its political and administrative formation and simply absorbed the former German Democratic Republic of the east. Since then the country has been one of Europe's strongest economic performers. The Hohenzollern family lived on after the fall of Prussia in 1918. They never renounced their claim to the Prussian throne, although all six of William II's sons swore not to succeed him to the German Imperial throne. The royal house is now led by the hereditary claimant, and a branch of the family is heir to the throne of Romania. Successive claimants to the Hohenzollern imperial throne are shown with a shaded background, while rival claimants and disqualifications (where these exist) are shown in green text. Son of Louis. Born 1976 and inherited title. Has no offspring. After naming Berlin in 1991 as the new capital of a reunified Germany, the capital is now moved from Bonn to Berlin. Bonn retains a degree of its status by becoming a federal city and retaining some offices in the new governmental structure. In the same year the last Russian and Allied post-war occupation troops leave Berlin. On 30 December 2007, which is the sixtieth anniversary of his abdication, the former King Michael of Romania signs a document entitled Fundamental Rules of the Royal Family of Romania. With this act he specifies that his daughter, Princess Margarita, is the heir to the Romanian throne with the titles 'Crown Princess of Romania' and 'Custodian of the Romanian Crown'. Michael also requests of the Romanian parliament that, should the monarchy ever be restored, the Salic Law of succession that prevents female succession be abolished. This act effectively bars Prince Frederick William of the German Hohenzollern-Sigmaringen family, of which Michael is a part, from inheriting the title. George Frederick, the son of Prince Louis Ferdinand, great-grandson of Kaiser William II, and the heir to the Prussian throne, is married on Saturday 27 August. His bride is Princess Sophie von Isenburg, who is just a year younger than the prince himself. The ceremony takes place in the Church of Peace in Sanssouci in Potsdam. The marriage, and the possibility of future issue, places Prince Christian-Sigismund's position as heir in doubt. Uncle. Heir until 2013. Son of Louis-Ferdinand. Born 1946. The marriage between George Frederick and Sophie von Isenburg produces the promised heir, plus a spare in the form of his twin. Carl Friedrich Franz Alexander is the elder by a few minutes and becomes the heir. Louis Ferdinand Christian Albrecht is the younger, while, Prince Christian-Sigismund is relegated to third in line to the succession. Son of George Frederick and heir. Born 2013.